When Amy Lewis prays for a savior, Loki Norse God of Mischief and Chaos isn’t who she has in mind. Loki can’t resist Amy’s summons, but he can insist she help him outwit Odin, ruler of the Nine Realms. 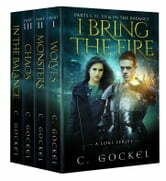 This box set contains the first three installments of I Bring the Fire plus In the Balance. It is perfect for fans of The Dresden Files and Terry Pratchett. Called into the FBI headquarters to identify a magical artifact, she gets the opportunity to find Loki for herself. In doing so, she tips the scales of not one, but two universes, and has to choose for herself what form she wants Chaos to take. Discover the series readers are calling hilarious and profound. Download this box set today. I'll definitely keep reading the series, the first few books were really exciting. Keep up the good writing! I can't wait to see what happens next in this series. I always love anything Asgardian, and this certainly delivers. The author has a light pen in the love scenes, which is nice, sometimes. The suggestion of scent, sound, touch - and my imagination gleefully filled in the rest. I really enjoyed this series, the characters were interesting and the story was unique. Loki's character was very entertaining. I really like the story line as I'm a huge fan of Norse mythology. But the author repeats themselves too much and I feel like it's missing a few things that could really push this book to the top. Author had a great mind tho and will look to see if I can check out other works done by them.